Are you thinking about making videos for social media? Or have you already tried and realized how time-consuming these videos are? It doesn’t have to be that way. You can make successful videos for social media with just a little bit of know-how. That received 26,000 views, over 300 likes, and 378 shares – for a truck backing up for 17 seconds. Yes, some video content is simply better than others – and in that case, it doesn’t matter how good the quality is. But most businesses need to share tutorials, product announcements, and interview videos. In those situations, video quality matters. So how do you make videos for social media in a professional manner, while not spending too much time or money? Understand that audio and lighting are often far more important than the video quality. You might need closed captioning or overlaying text for those hard of hearing or at work. Keep it short and to the point. Each social network has different results with video lengths, so you should learn how long your videos should be for each one. For instance, Facebook videos no longer than one minute get the most attention. Instagram limits video uploads to 60 seconds. Most other major platforms don’t have regulations like this. Instagram also only allows uploads from mobile devices. Desktop uploads aren’t allowed right now, so if you have a video for social media on your desktop or a camera you’ll have to send it to your phone through email or a file sharing service. We could walk through quite a few other tips on sharing videos for social media, but now we want to explain the entire process from start to finish. The order doesn’t matter at all, but it’s crucial to comprehend the specifics from each point. Even a simple video from a smartphone requires time to think about what needs to be said and what you’re going to show in the video. More professional social videos get even more complicated, where you have a script, maybe some decent equipment, props, better lighting, and some test runs. After all that work, the idea of seeing a video get a poor response is devastating. It might convince you that videos for social media aren’t for your company. One of the great parts about Facebook is that you don’t have to spend a single advertising dollar on the posts that get poor responses. However, once in awhile you get a gem that receives more interactions than other posts. That’s when you want to pull the trigger and spend some money on promoting it. REI, for instance, saw far more people interacting with its “What’s Your But” video campaign–so, naturally, REI promoted it on Facebook. Brian Peters from Buffer explains five places to find ideas for your social media videos. One detail you’ll notice is that each idea revolves around already proven content. So, if you write a blog post that receives a good response, that’s something you have already validated. Blog content – this one is simple. Sort your blog posts to have the most popular ones at the top. All of a sudden you have hoards of great video content. Customer questions – whether you have a customer survey or you document the questions you hear from customers, these are the thoughts that people want to be answered in videos. Industry news – these types of videos take far less time to create, and they often work well in B2B industries. Most of the time you only need to create little slideshows with overlaying text to explain the news. Inspiration – Brian explains inspiration as the fun, creative ideas that pop up randomly about your business. Sometimes they’re duds, but sometimes they go viral. Hacks, tips, and how-tos – these types of videos often get the most shares, since they are industry specific. People are interested in learning, and videos are typically the best way to teach them. Sometimes you don’t need an actual script if there’s no one talking in the video. However, an outline and rehearsal for a product promotion video, or a panning video throughout the office, is also important. Businesses have to use time wisely, so video scripts don’t have to be completely formal. There’s no perfect formula to use when making your script or outline. However, I suggest following these eight steps to writing an awesome video script. Combine this with a solid jump cut strategy (outlined later in this article,) and you have a great recipe for video preparation. When creating videos for social media, you have several options when selecting the type of format you’d like to show: portrait, landscape, square, or fullscreen. Portrait and landscape are quite popular when recording social videos on phones, however, the most foolproof format is square. The other formats have their advantages as well. For example, portrait is the format that people are used to viewing on phones and other mobile devices. So, if you know that most of your audience is watching on a phone, portrait works well. On the other hand, an audience filled with people on their desktops would benefit from the landscape mode, since you can fit more into the frame. Choosing between landscape and portrait mode is not the end of your decision-making process. You can absolutely film videos for social media without thinking about the video specs. Facebook, Instagram, YouTube, and the others will reformat the videos to make them viewable on the respective platforms. Yet for the best resolution and viewing experience, it’s a good idea to know the expected video specs for the platform you plan on posting to. Therefore, I recommend bookmarking this always up-to-date guide to social media video specs. You’ll learn things like how Facebook recommends video dimensions of 1280×720 for landscape and portrait. As you scroll through your own Instagram or Facebook, how do you watch videos? Is it with or without sound? Considering so many people are at work, and these social networks don’t automatically activate the audio as users scroll over your video, you must get creative with how you frame your message. In short, the video viewers should be able to digest the core message with or without the audio on. How do you complete this task? One solution is to explain the core message in the description. The problem with this is that you’re then forcing people to read when they thought they were about to watch a video. However, it provides a quick way to get some wording across without a more complicated method. Another option involves placing overlaying text in your video. This is similar to closed captioning (talked about below,) but it’s more suitable for simple instructions and videos without people speaking in them. A good example is any type of tutorial video you see on Facebook or Instagram. Quick cooking tutorials are popular, where the user can check out a recipe without listening to the audio. They still get the main ingredients and cooking requirements to write down or memorize. Closed captions are well-known in the television world as the text that comes up at the bottom of the screen. Closed captioning was designed for people who are hard of hearing, but studies show that 80% of viewers who use closed captions have no hearing restrictions. Discovery Digital Networks completed a test with 100 social videos, adding closed captions to some and leaving them out for others. Within two weeks the company saw a 13.48% increase in views for videos with closed captioning. Closed captioning doesn’t make sense for videos with minimal or zero dialogue, so it’s best when a person is speaking the entire time. The example below is a Food Network episode. For this blog post, you will have to activate closed captioning by going to the video’s Settings, then checking Closed Captions. However, all videos with closed captions on Facebook automatically show them when the sound is off. So, how do you add closed captions to your social videos? Adding closed captions to Instagram video is a hassle and they aren’t common practice. And considering Instagram videos are limited to 60 seconds, you’re better off sticking with overlaying text. Facebook and YouTube, on the other hand, both provide simple closed captioning tools. For instance, YouTube lets you type in the closed captioning yourself. There’s also an upload button for file types like .srt and .sbv. If you have no idea what these are, it doesn’t matter much, since you’ll most likely hire someone to caption a video in the right file. Facebook offers an auto-captioning tool where it tries to recognize the dialogue and converts it into captions. It works pretty well if you have excellent audio, but most of the time I’ve had to go in and adjust mistakes. Facebook also includes an option to upload an .srt file. If you’re interested in learning more about closed captions on YouTube, Google offers a comprehensive guide for adding subtitles and closed captions. For Facebook, I recommend the Animoto guide–which shows the basics along with some excellent tips for making your own .srt files. When considering the right equipment to make your videos for social media, start with sound. Subpar video quality, especially in the social age, is forgivable since we’re used to seeing it all over the internet. Pair that with the fact that you already have a camera on your phone and it’s best to spend resources on sound before a fancy camera. How much should you spend on a microphone? This depends on your budget and how you’d like to film. I usually recommend spending up to $50 for starters then going up to $150 on the high end. Lavalier microphones are budget-friendly and great for moving in your video. It clips to your shirt, and many are made just for iPhones and DSLRs. USB microphones work when filming from a webcam or DSLR. They sit on your desk, so you wouldn’t use one while walking around for a retail store demo. Shotgun microphones capture the best sound while minimizing background noises. A shotgun mic plugs into your camera’s auxiliary input and mounts on the top of the camera. This way, you achieve excellent sound and movement capabilities. And the microphone isn’t in the frame. If audio is essential to your story, consider getting a microphone. If your videos don’t include dialogue, or you plan on inserting music or sound effects over the speaking, a microphone is unnecessary. For instance, tutorials often show visuals, with minimal speaking. Therefore, the only audio equipment needed is editing software, for adding music or getting rid of background noise. Lighting removes harsh shadows and makes your subjects more pleasing to the eye. It shouldn’t cost much at all. Expensive film lighting kits exist, but there’s no need for them when filming your social videos. Instead, make a trip to the hardware store to get three clamp lights. That’s it. 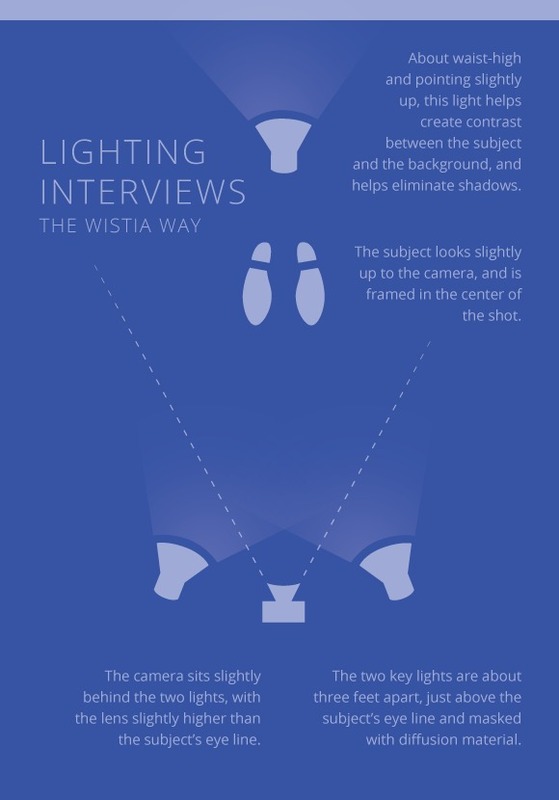 You can get fancier, but still stay under budget, by using Wistia’s DIY Lighting Kit Guide. The goal is to follow basic lighting principles, and combine items like light stands and clamp lights, to make a set for under $100. In my opinion, yes. It’s more important than buying an expensive camera. Tripods are sometimes a requirement if you have no one there to hold the camera. Outside of that situation, the tripod cuts down on camera shake. The good news is that Amazon and Best Buy offer cheaper tripods for small cameras, along with flexible iPhones tripods that latch onto other items. DSLR tripod research gets a little trickier. Professional photographers often state that going cheap on a tripod is the worst decision you can make. This is because DSLR cameras and lenses are heavy. Therefore, you need to make sure that the tripod can hold the weight. Most Android or iPhone cameras are suitable for capturing high-resolution video. The main way to improve that video is with lighting, audio, and tripod equipment. That said, most companies interested in making videos for social media have two camera options: phones and consumer DSLRs. Skip the high-end editing software like Final Cut Pro X and Adobe Premier. If you have a person in-house who’s skilled with these professional software options, go for it. But remember, you can typically make your video just as good without paying for the software and skilled employee. If you’re not interested in hiring a skilled editor or filmmaker, yet you’d like to produce quality videos without any previous editing experience, consider software like Filmora and iMovie. Consumer editing tools allow for cuts, filters, transitions, special effects, and more. Those are the basic features you’ll need to create a quality result. Furthermore, it’s a good idea to understand, and utilize, the basics of jump cuts. The video above has information on the benefits of jump cuts and how you film for and edit the effect. In short, a jump cut removes the need to memorize a script. You’ll have short talking points and hopefully someone to read them to you while filming. You would take your script and film the talking points without trying to make it perfect. So, the “ums” and coughs and pauses can be cut out later. One of the biggest time consumers when working with a PC or Mac-based editing software is waiting to get the video on your computer, import it into the software, then export it to the proper format. With a DSLR, this waiting is inevitable. However, camera phones have some powerful apps. This way, you capture the video on your phone, edit on the phone, then post to social media from the phone. The iMovie app is available for the iPhone and gives you more control over your edits. Animoto is user-friendly and meant mostly for marketing. It has both Android and iPhone apps. Magisto attempts to complete the entire editing process for you. You add your videos and pictures, choose a theme, type in some text, then Magisto compiles and cuts the video. With iOS and Android apps, Magisto is an outstanding way to make videos for social media, especially product demos and tutorials. Are you ready to make videos for social media without looking like an amateur? Producing videos for social media seems intimidating at first, but the goal is to make the process less tedious and time-consuming for the average business. With the steps covered above, you can go from idea to editing without paying too much or worrying about quality. The post How to Make Videos for Social Media Without Looking Like an Amateur appeared first on Revive Social.